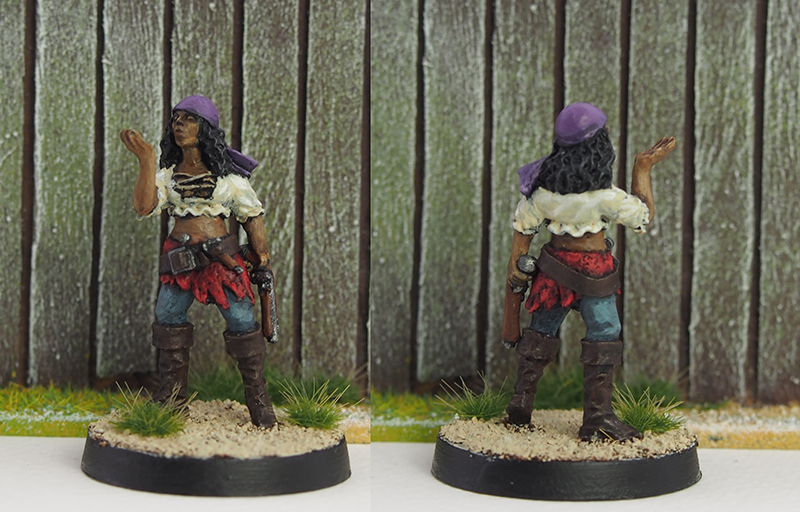 Finally more painted pirates! These have been on the bench for a while, and they’re pretty much the first miniatures I’ve painted all year. While I’ve done some terrain building and painting, minis have fallen by the wayside a bit. 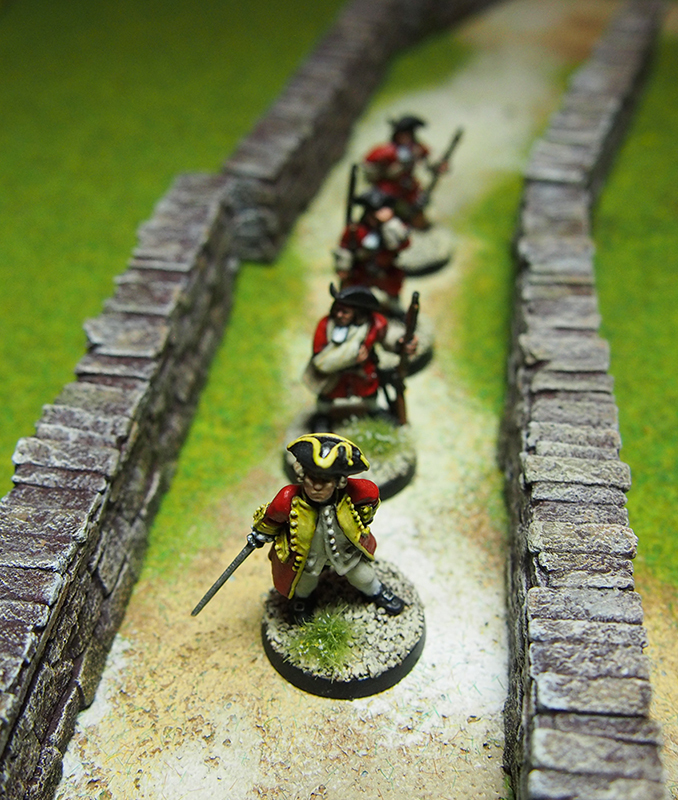 This should be rectified shortly, as I’ve promised to paint up some stuff for Salute, and that’s exactly a week away. 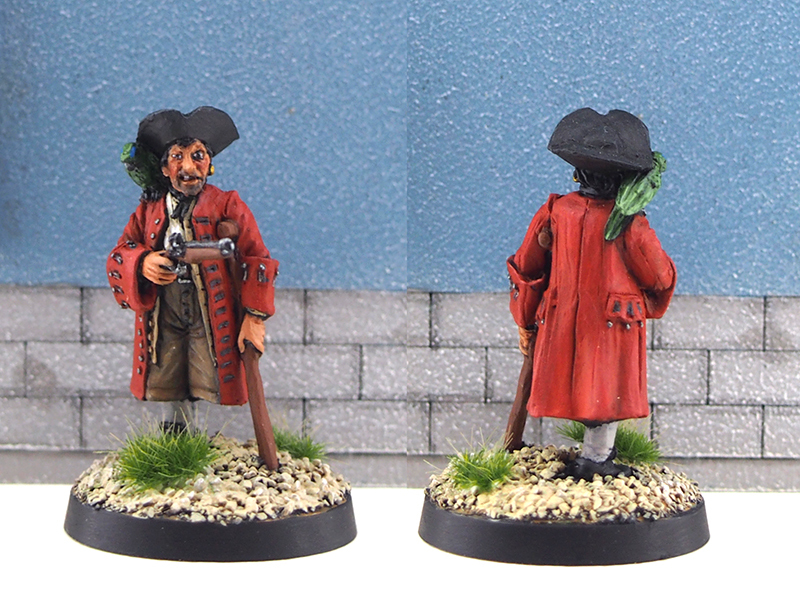 Another maroon from Foundry, I love these guys and I’ve painted a couple before. Simple, elegant sculpt, simple, not so elegant paintjob. It does the trick though! I asked Emmi to pick the colours, which was surprisingly fun. I notice myself going back to tried and true combinations of colours, which can mean things getting a bit samey – I can’t remember how many times I’ve used the combination of Vallejo Khaki and Vallejo Cayman Green. What can I say, they’re lovely, muted tones with awesome coverage. 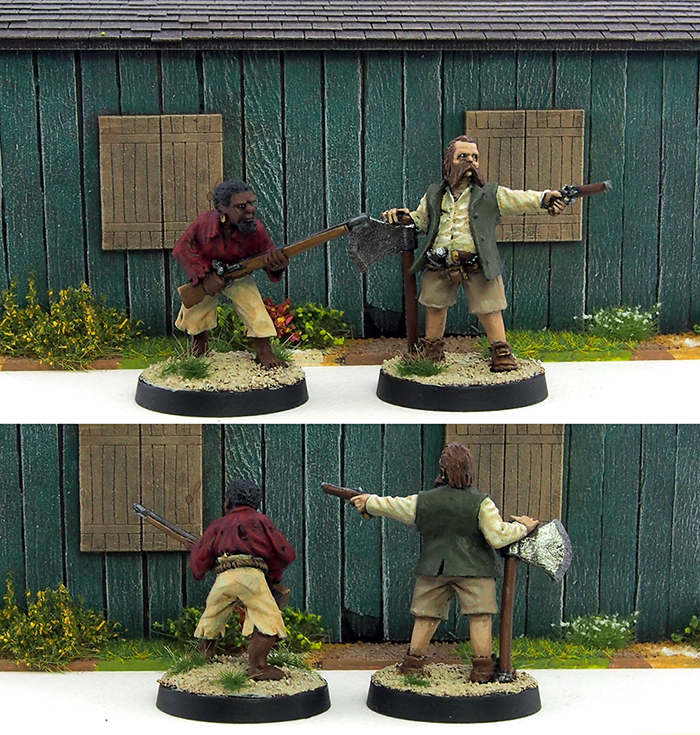 The second one is a pirate from Black Scorpion, with a massive axe and some equally massive mutton chops. He’s somewhat reminiscent of Mr. Gibbs from the Pirates of the Caribbean films, and I’m sure I’ve seen him used as a proxy somewhere. Funnily enough considering the previous paragraph, his vest is Vallejo Cayman Green and his trousers are Vallejo Khaki, what do you know! I’m super stoked about going to Salute! It’s become a yearly tradition by now, and very much a social event and a great chance to meet all the lovely folks I’ve befriended over the years in this hobby. This year I’m looking forward to bumping into Alex of Leadballoony fame as well as spending time with the nice people from the Random Platypus forum. After Salute we’re heading up north for a hundred miles of hiking along the Pennine Way, which I’m possibly even more stoked about. This will likely mean that the blog will be dormant for a couple of weeks, although considering my rapid-fire posting, you won’t be able to tell any difference. 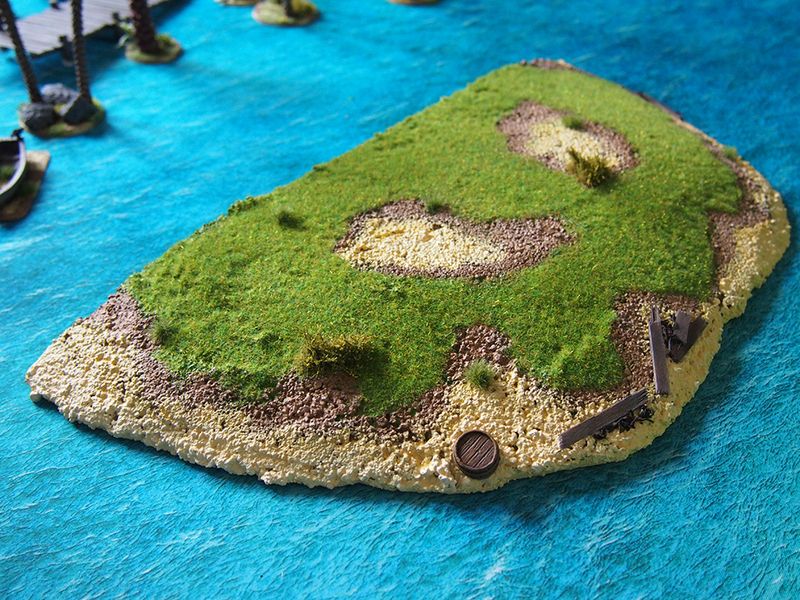 Like many other hobbyists (I assume), I have terrain pieces amassed through the years. After showing some old green hills in my previous post, I figured there might still be some use left in them. While I claimed they were from the 1990s, thinking back I’m fairly sure they’re mid-2000s as I remember us making them in my current apartment, so 10+ years old at least. Now, when these were built, we prized durability a lot. 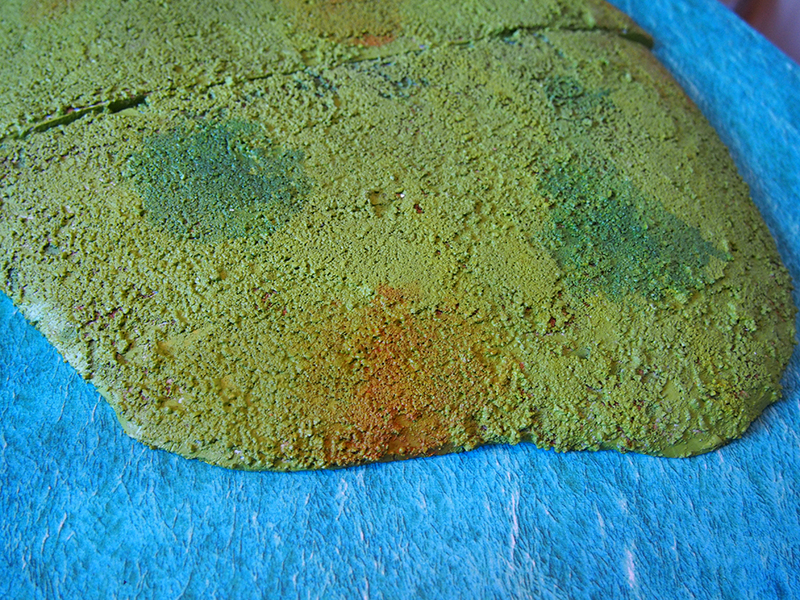 The hills were carved from blue foam and then covered with a pva/sand mix. A phrase from an old White Dwarf sums it up: “In the morning you’ll need dynamite to shift it.” Of course the sand we used was a very cheap one, so it’s coarse as anything (and I’ve still got about 5-6 kg of it down in the basement). This in turn led to the hills (and the gaming boards built in the same manner) being terribly miniature-unfriendly. Basically, if you knocked a metal mini over, it was almost certain to chip. Good times! I was already contemplating throwing the hills away, but as they already existed, I started thinking that they could be revived and actually put back to use. Out came the craft store acrylics, the static grass and the tufts, as well as some coffee stirrers, tea leaves and some sunken resin barrels and what do you know, they actually turned out pretty nice! The static grass helps with the aforementioned chipping issue too. They can be used either as table edge pieces or put together to make a larger island. 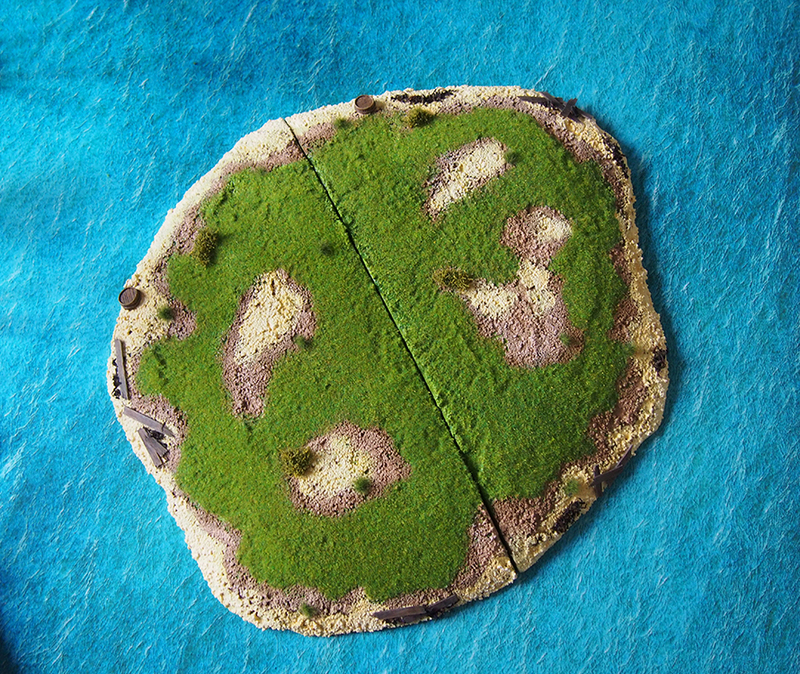 Painting them as islands obviously limits them to more nautical games, but I’m fairly certain I’ll have some of those with my lovely new ocean mat. 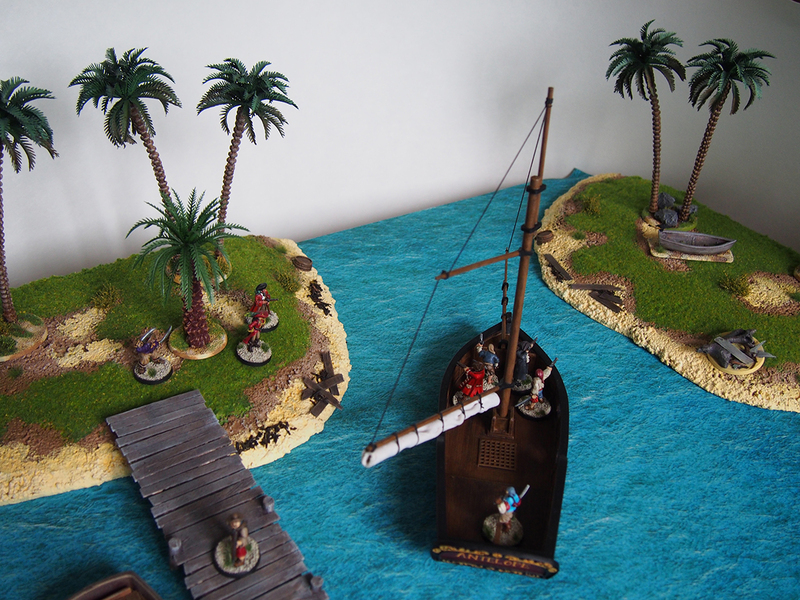 Here’s what they look like with scenery items and miniatures placed on the pieces. Sorry for the slightly overexposed quality of the photos, the pieces are so large that I had to rely on daylight rather than my usual lighting – and to be honest, I couldn’t be bothered to tweak camera settings. 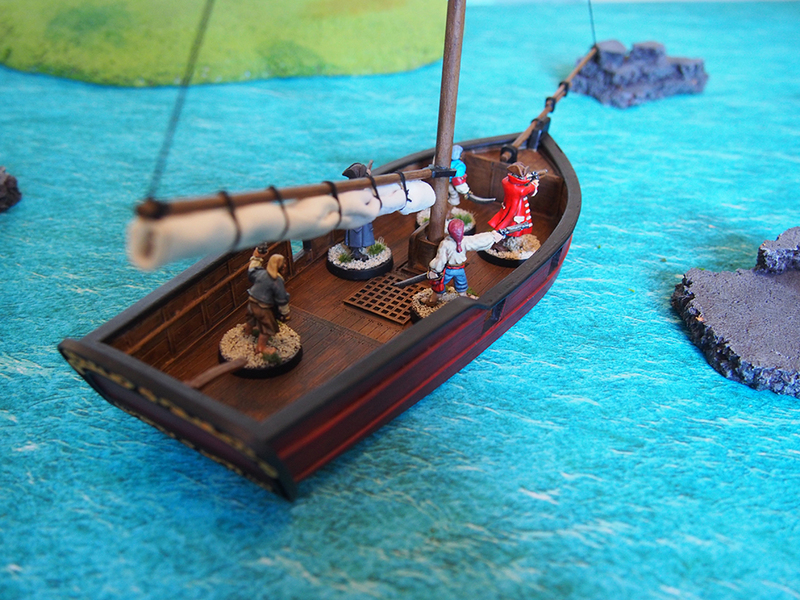 It just so happened, that I wanted a gaming mat for sea battles – possibly unsurprising considering my pirate infatuation. Turns out such a mat isn’t all that easy to find! 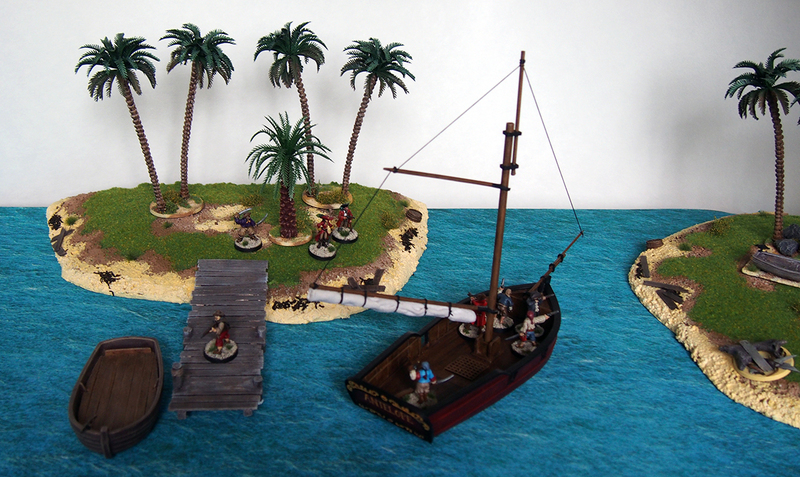 You’d assume it to be a common gaming mat staple: a lovely, greenish-turquoise Caribbean seascape is pretty iconic and it’s not like pirate gaming isn’t popular. However, this assumption would be wrong. 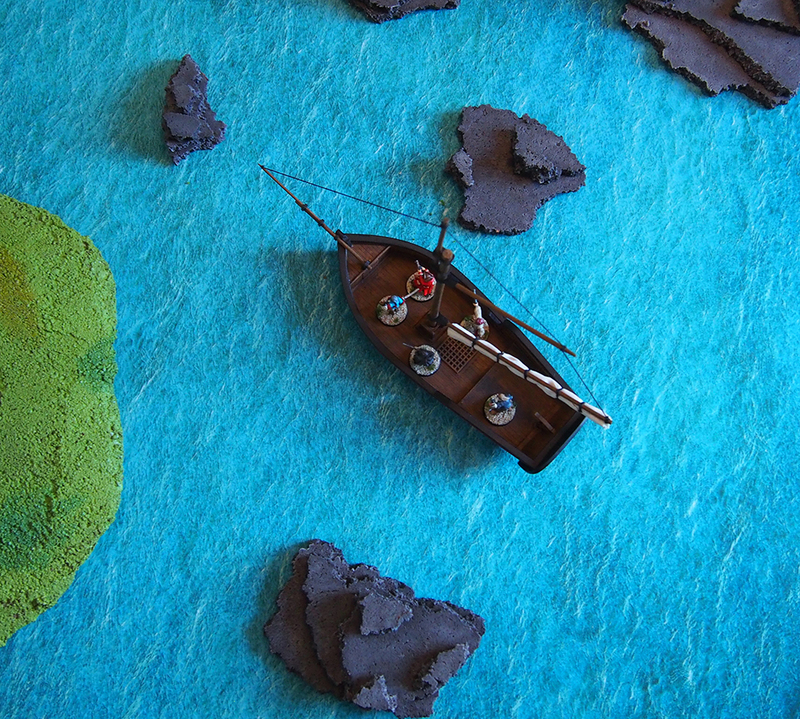 While there are seascapes available, many of them are very much a dark blue. This is nice in itself and probably fits most naval games wonderfully, but it’s not ideal for evoking a sunny Caribbean/West Indies feel. Furthermore, I wanted the mat to be mousepad material as it’s easy to store, lays flat and has a nice feel to it. After doing plenty of googling and window shopping, I ended up looking at Deep-Cut Studios’ custom mat printing service, Print-O-Mat. I was overjoyed, now all I needed was a suitable image, and surely one would be easily available. How wrong I was. As is apparent in hindsight, you need a very big image for a quality print, and I was going for a 3x3ft map – roughly 90x90cm to fit my small table. While there are beautiful stock photos of Caribbean waters, you need a very high resolution for a high quality mat. 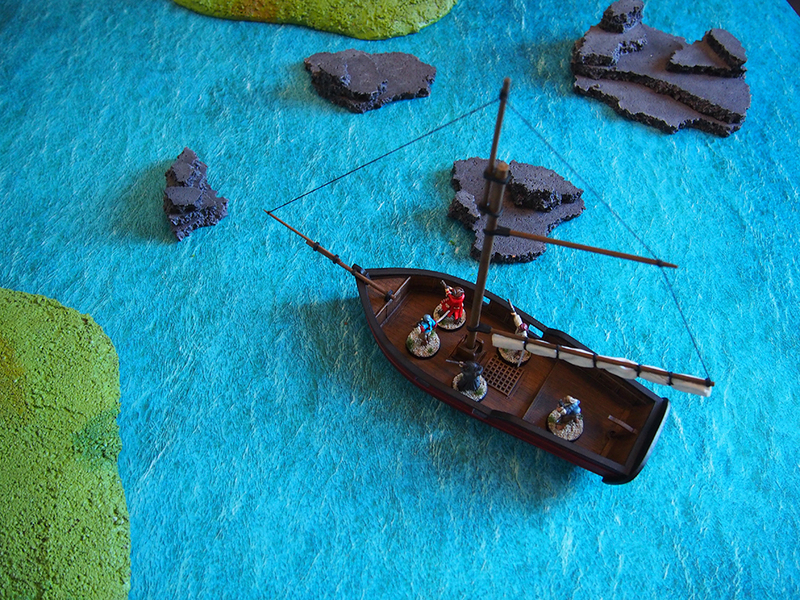 After spending hours searching through various photo archives both free and commercial, I settled on something especially designed for the purpose: a printable battle mat image from Tiny Worlds. A bargain at $4.50, it suited my needs wonderfully. 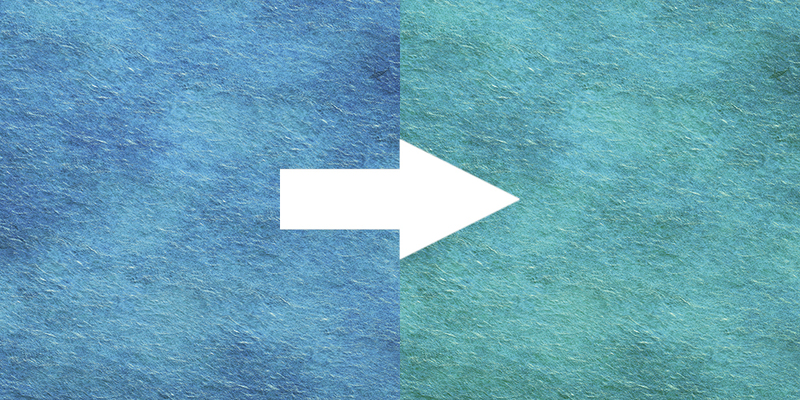 While it was also very blue, purchasing it as a file meant that I could simply use Photoshop to tweak it to my needs. I edited the colour balance to make the mat more green to evoke the correct genre feel. Pleased with the result, I headed to Deep-Cut Studios’ site and used their simple interface for creating the mat. The final price for a 90x90cm mat was around 40€ with a flat postage rate of 15€. Deep-Cut is situated in Lithuania, so no customs charges for a Euro customer. I was quite happy with the price altogether! The mat was very speedily delivered in a work week, and boy, was I impressed with the end result. As you can hopefully see in the photos, the mat is crisp and vibrant. While colours are a tad darker than the original image, it’s still a faithful rendition and looks pretty much just like I imagined, and it should be noted that the lighting conditions and camera settings distort the colour in the photos! 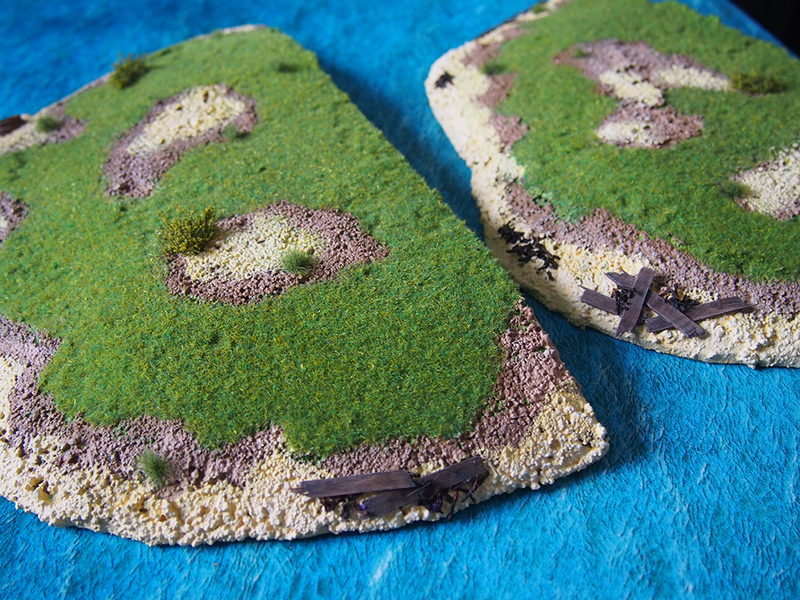 I threw down some super old hills that were originally made for WHFB way back in the 90s (I think) as well as some of my badlands/scifi cork outcrops that make for surprisingly nice rocky shoals. I love how it looks. Overall verdict: I’m super happy with my custom mat. Great quality and quick delivery at a very reasonable price point. While a part of the credit obviously goes to Tiny Worlds for the original image, I’m really, really happy with Deep-Cut’s service and will likely use them again. Painted stuff! Not miniatures as such, but very useful nevertheless. Inspired by both Azazel’s monthly challenge and my lack of time to focus on miniatures, I figured it would be fun to add some generic scenery pieces to my table. All of these are from Fenris Games, one of my favourite companies for miniature terrain, and part of Fenris’ Rubble City range. 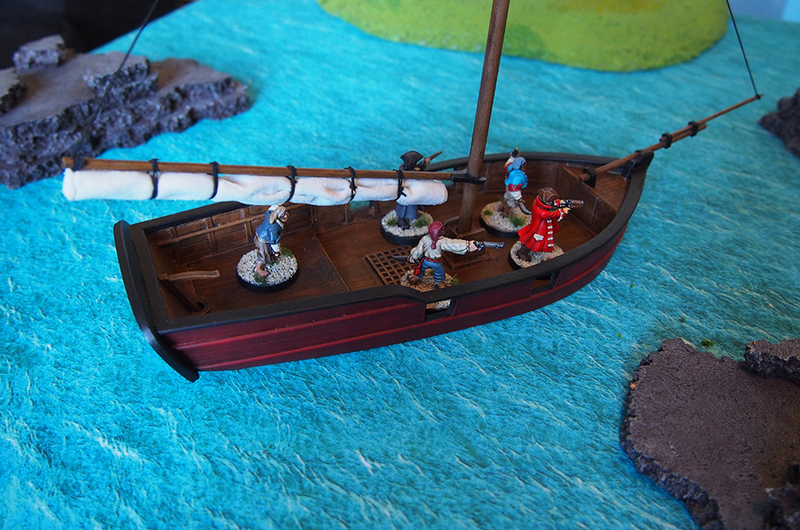 For a change I figured I’d photograph the pieces on the gaming table! 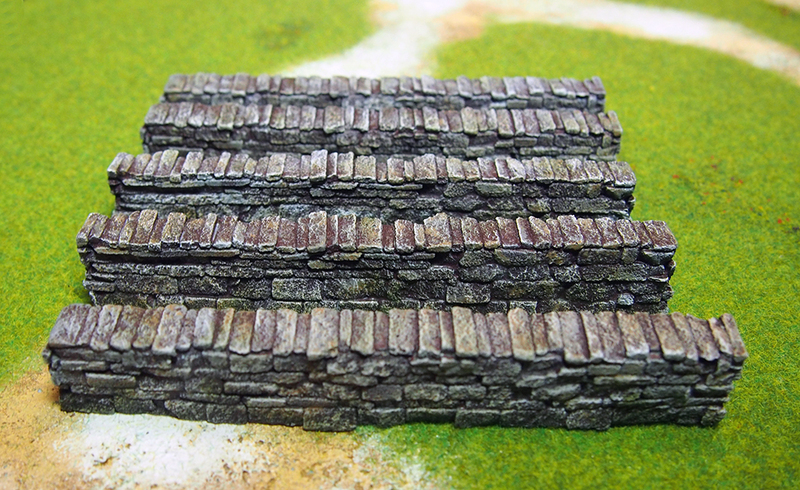 I actually painted these fieldstone walls last year after buying them at Salute, but as I gave them a bit of touch-up, I thought to include them here as well. There’s nothing super special about them, but that’s pretty much what I like – they’re nice, clean and generic enough to go with pretty much anything. 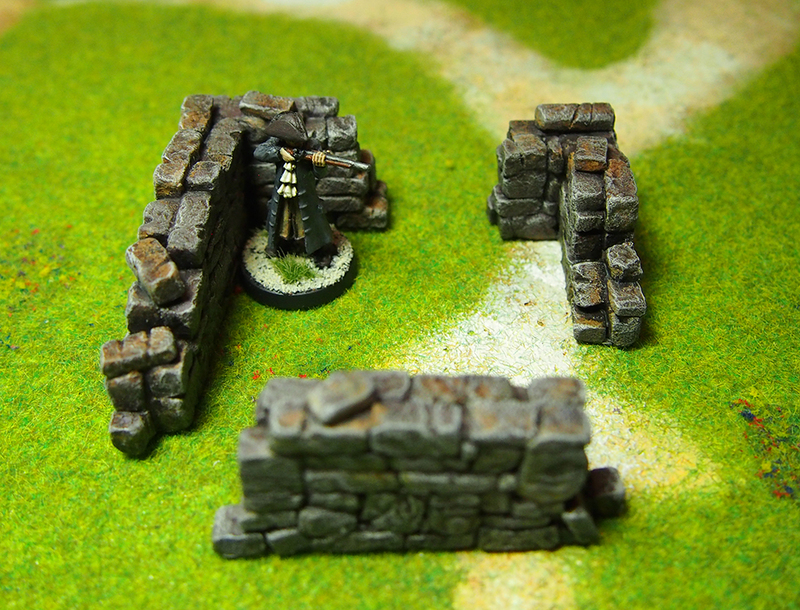 There’s a similar charm to these rubble walls and corners that I got as part of Fenris’ Rubble City Kickstarter. 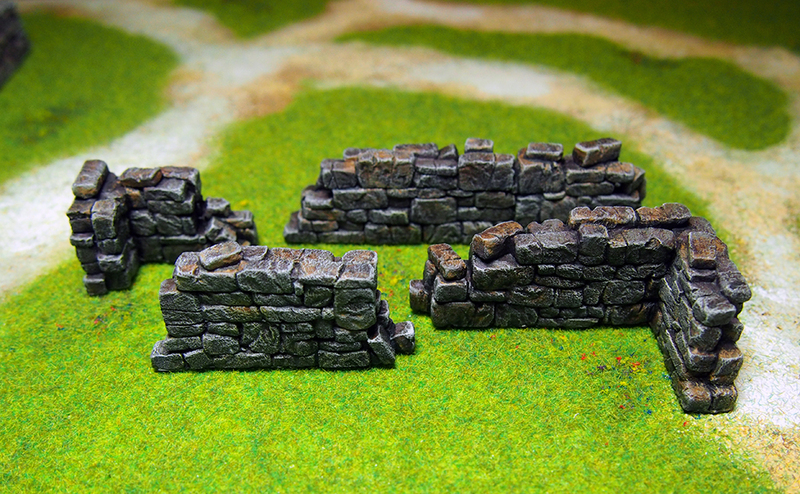 Like the fieldstone walls, these are super clean sculpts and very crisp casts so a veritable joy to paint. Paint jobs were simple, but I’m happy with the end results. I painted all the pieces using mainly craft store acrylics. I started with a dark brown base coat, stippled on browns and grays, followed with progressively lighter gray drybrushes. 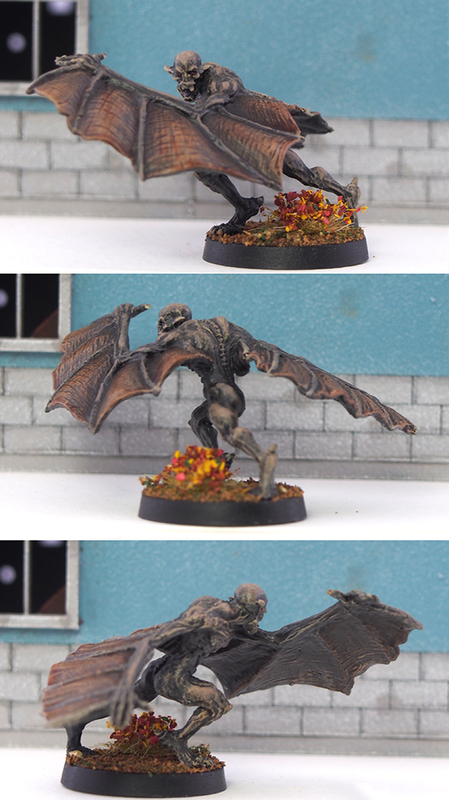 I then slapped on some Agrax Earthshade and finished everything with Athonian Camoshade (think Agrax Earthshade but green) at the base of each piece and painted splashes of the wash here and there. 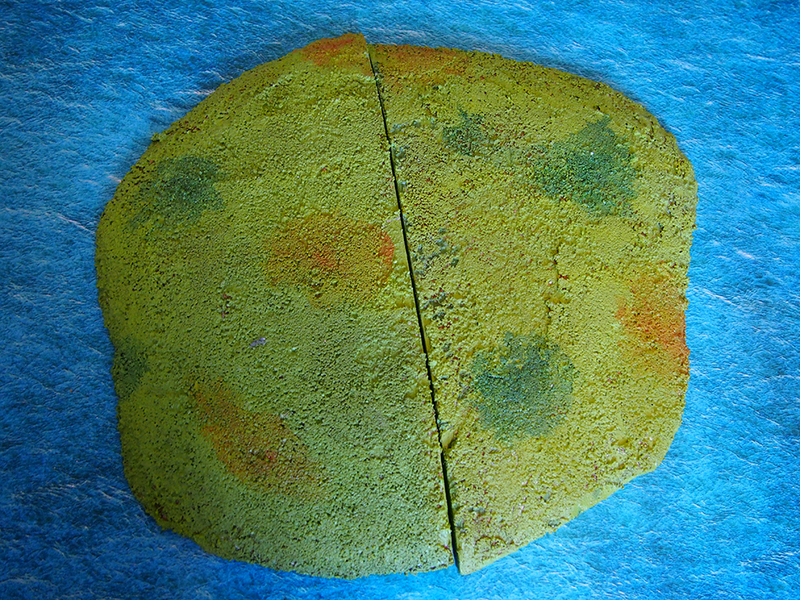 I think the stone looks quite naturalistic, which is what I was going for! 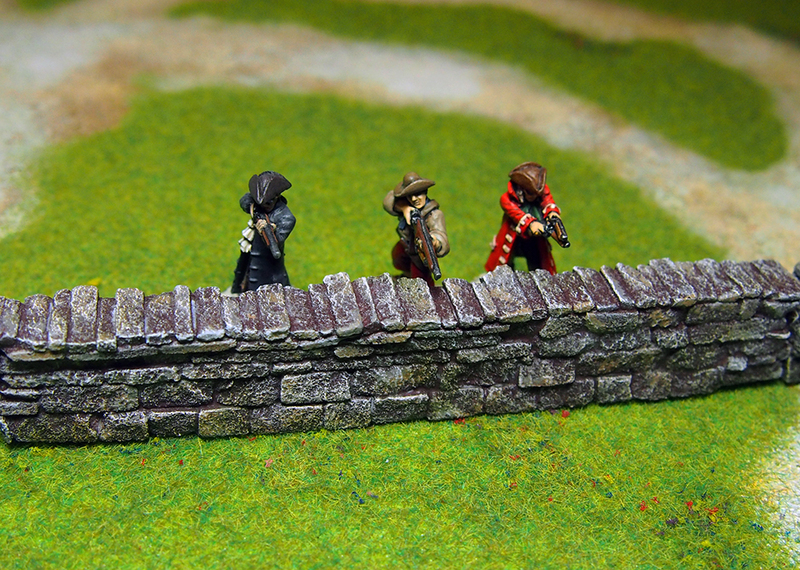 These are really useful gaming pieces, so I figure’d I’d show you a couple of shots with figures. The walls and ruins fit wonderfully into my Caribbean setting, but would definitely not look out of place on any fantasy or even modern table. 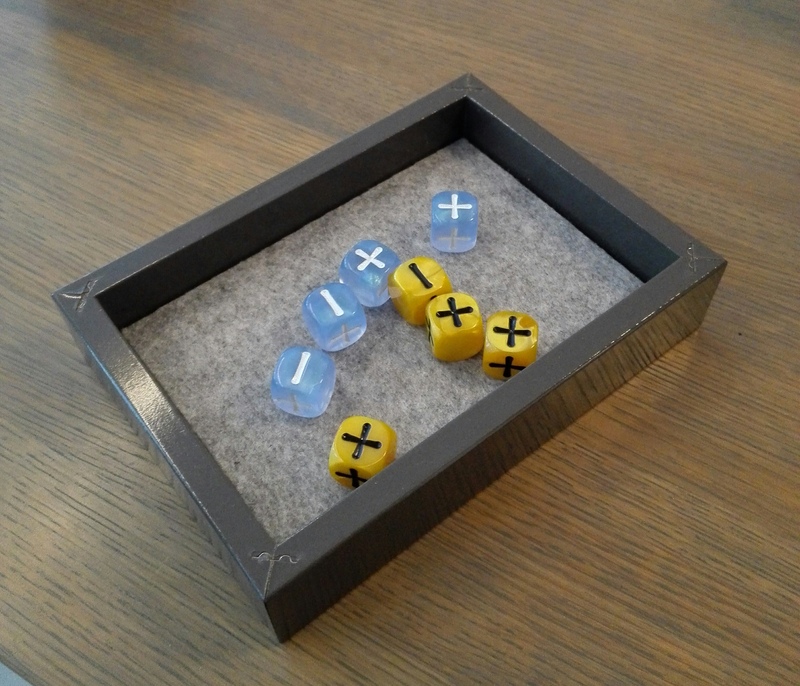 The year’s first finished hobby project is gloriously simple: a dice tray. I’ve never considered dice trays to be all that necessary to be honest, but they do bring a satisfying neatness to rolling dice. I had been thinking of making one for quite a while, so when the opportunity presented itself, I jumped on that train (more like trayn, amirite). The tray is a simple IKEA hack that has been around for quite a while. I bought an old RIBBA picture frame for 0,50 EUR from the local Reuse Centre, threw away the glass (plastic in the newer ones), ripped out the stand, pulled out those little tabs of metal that hold the backing board in place, added a couple of pieces of cardboard to bring the rolling surface up a bit and to cover the holes where the tabs used to be, glued a suitably cut piece of hobby felt in place with PVA, and what do you know, a neat little dice tray. All in all, it cost me exactly 0,50 EUR, as I got the felt from a friend – incidentally left over from her similar dice tray project. I can now roll my dice with a satisfyingly muffled clatter. The tray ended up looking quite nice, although I’m thinking of decorating the corners with something suitable. The small size means that it’s actually quite convenient to take along to gaming nights. The tray has seen quite a bit of use already, as the early year has been wonderfully RPG-heavy. What went down in 2018? It’s a new year, yes it is! Another year behind us, and this blog is still going – not as strong as it once was but still happily plodding along with no signs of stopping. Must have been one of the most quiet years of the blog, averaging a neat one post per month. I’m not stressing over it, but I would like to blog more. Maybe that’s a new year’s resolution of sorts. I did paint a bit and do some other hobby stuff, although not as much as I would’ve wanted to. Home renovations, Emmi moving in and a new job in another city did cut into my hobby time quite a bit. Anyway, less grumbling and more positivity, so what did I do? The things I haven’t featured on the blog yet? Terrain pieces, a battlemech, some animals and a few more pirates and civilians. Any of these tickle your fancy, dear readers, and I’ll be happy to bump them up the blogging queue. 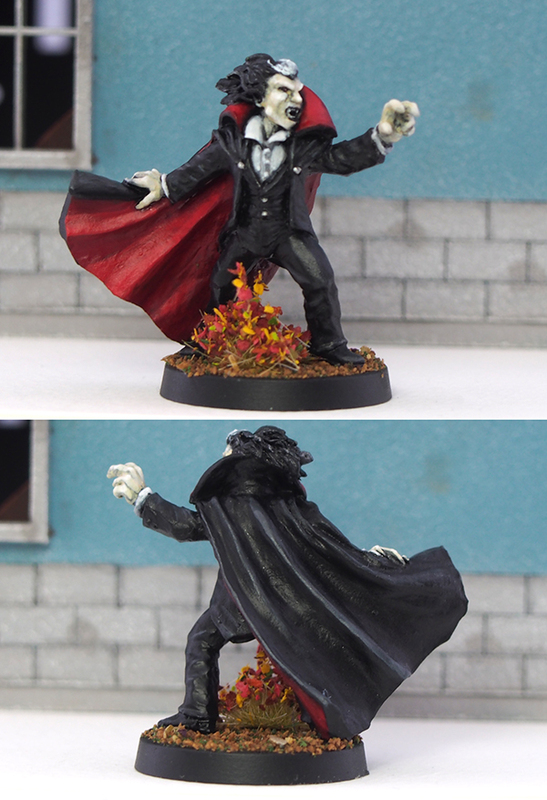 I did get in on some Kickstarters and was happy with all of them! 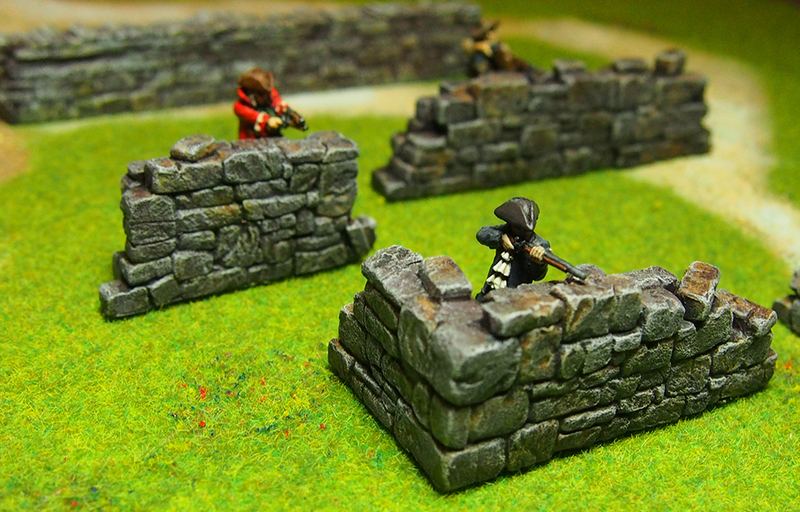 I got a Spanish fort from Slug Industries, some lovely ruins from Fenris Games and some samurai animals from Bad Squiddo’s onna-bugeisha Kickstarter. All of them are obviously still unpainted, but I’ll get around to them. The fort I’m definitely planning to tackle in 2019, hopefully the rest too! As the years go by, other people in the hobby become more and more integral to enjoying it. 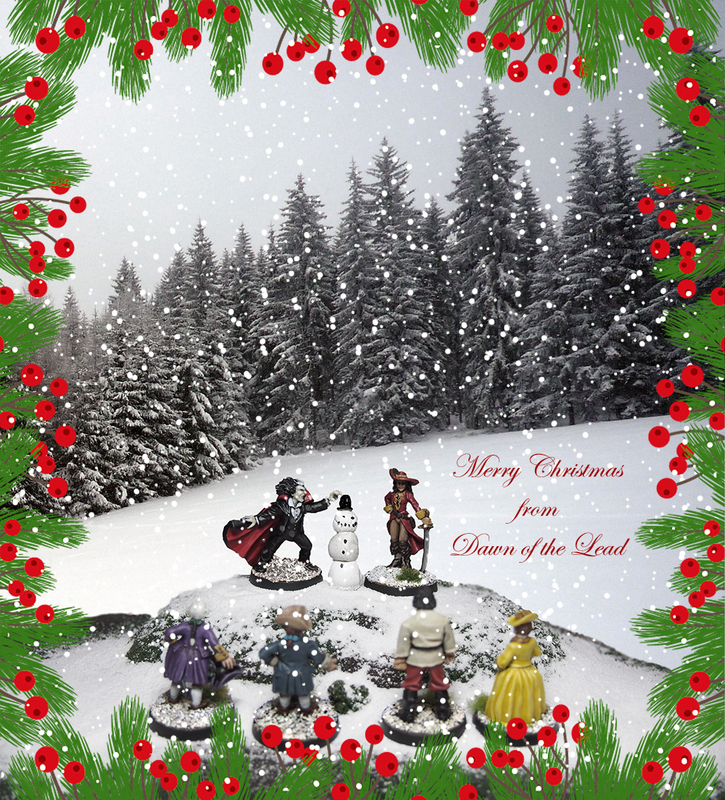 There’s a small, regular crowd that frequents this blog as I do theirs, and a shout-out is in order to the wonderful people running sho3box, Leadballoony, The Raft, Azazel’s Bitz Box and Imperial Rebel Ork – as well all the rest of the wonderful people who drop by to comment. Your contribution and interest is one of my main motivators for doing the whole blogging thing, so a heartfelt thank you for that. Meeting some of you in person have been hobby-related highlights of the year for me. I visited a couple of conventions, too! By now Salute is a regular feature of my year, and this will happen next this year as well. I went to Crisis in Antwerp for the first time ever this year, and can heartily recommend it! It’s a great show and Antwerp is lovely too, so we turned the trip into a nice little romantic getaway. Check out Thomas’ post on Crisis 2018 for a great recap of the event. If you want a great convention in Europe without the bustle, hassle and high costs of London (for Salute), I definitely suggest giving Crisis a try. All in all it was a very nice year! I’m surprised that the pirate project is still alive – it started in 2015 for crying out loud – and still my main focus. That’s it, dear readers! Have a great 2019 and thanks for your support, friendship and other warm, fuzzy things.